It is called Fenerite Complex (in Bulgarian „Fenerite“ means „the lanterns“). The hotel is lit by lanterns as you can see from the picture, and that makes it an especially romantic place at night. Fenerite Complex is situated in the village of Kmetovzi, just 12 km from the town of Gabrovo. The first thing you notice about the village is the unique spirit of an old epoch, the traditional architecture of the 18th century, so charming in its simplicity, the narrow cobblestone streets. There are hardly about 100 houses in the village, all surrounded by the box and wild geranium bushes, compulsory for Bulgarian village gardens. 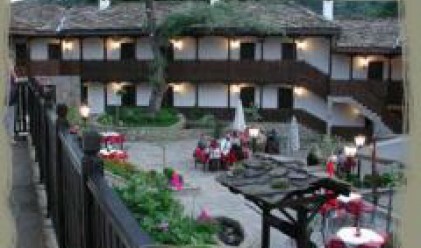 At the small village square you will find the restorated building of an old lodging house – this is the Fenerite Complex. The place is filled with serenity, and that is what we most need at the end of the business week. The hotel is divided into two parts – Fenerite 1 and Fenerite 2. Fenerite 1 has one VIP suite, two standard suites, two deluxe double rooms, and seven standard doubles. Fenerite 2 has two standard suites, 14 double rooms with a bath tub in the bathroom, of which 11 are standard, and 3 luxurious. All rooms are equipped with a TV, video recorder, telephone, the bathrooms have heated floors. In other words, the complex has the capacity to accommodate all of your friends. This shouldn't be a place to visit only while on holiday. The hotel complex is also perfect for business seminars or team buildings. It offers a cosy conference hall seating 60 people, and equipped with flipchart, TV and video. Rates are more than reasonable. A single room costs 60 leva, a double is 85 leva per night. A standard suite (with two beds) costs 105 leva, and the bigger (4-beds) suite costs 140 leva. So, don't stay in the city this Sunday. Grab your bag and do something interesting! Wherever you choose to go, I hope you have a grand time. And don't forget, meet me here same time next week to learn more about great weekend getaways in Bulgaria!